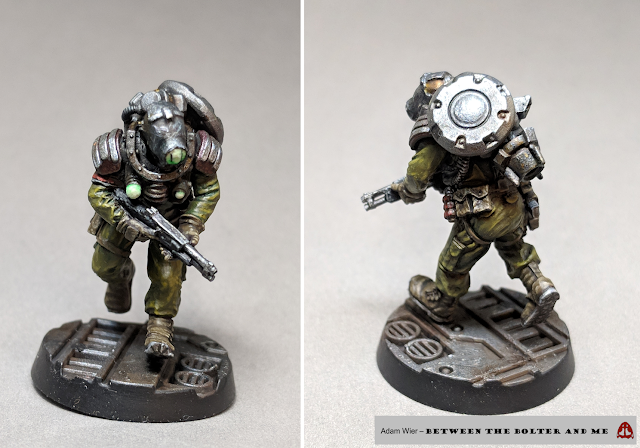 To keep with the setting, I decided to paint the mercenary in drab, realistic tones. I used various Scale75 silver and gold paints to paint the metallics on the model. These were then enhanced with a series of GW shades and Ammo of Mig oils. When planning out a color scheme, I knew that I wanted the focal point of the model to be the mercenary’s helmet visor and chest lamps. 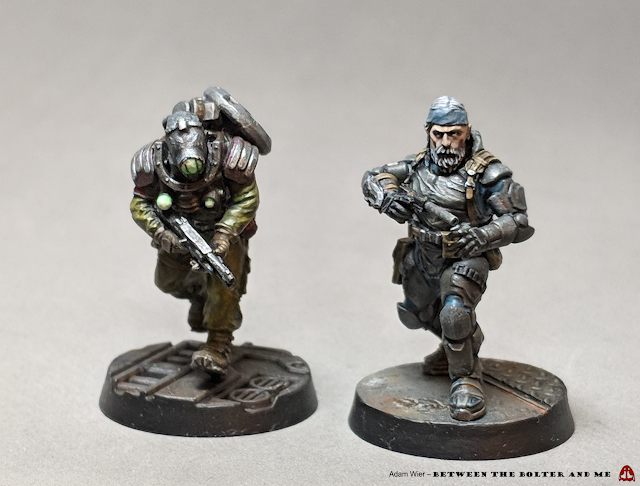 I envisioned the mercenary stalking their prey through rusting shipyards, an eerie glow emanating from their helmet. To achieve this, I painted the helmet visor and lamps with a paint that I created with a glowing pigment called Lit from Stuart Semple. I had never worked with the pigment before, but it was not difficult to mix some with the base they sell and paint it on. I feel that I could experiment with the amount of pigment that I use to get an even more dramatic effect, but as it is, the visor (and lights on her chest) glow quite brightly in dim lighting. 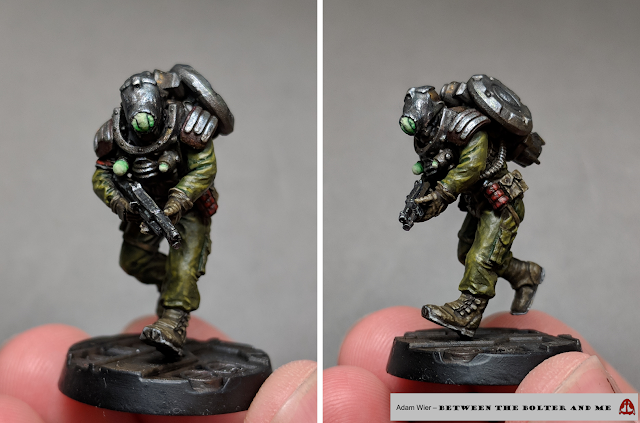 To add some additional visual interest to the model, I painted certain details, like the grenades a deep red. I used light grey to paint details such as the tread on her boots and the textured grip on her pistol. 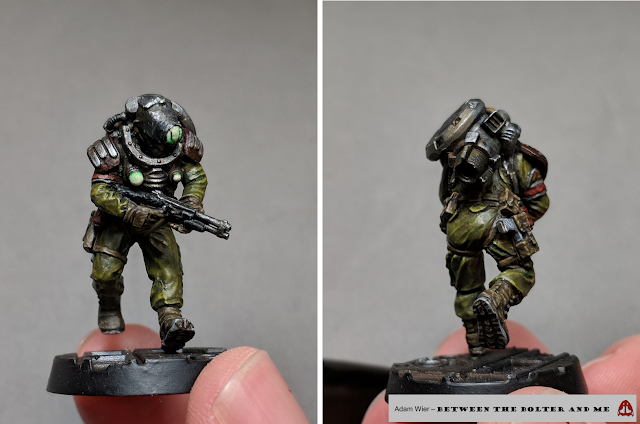 For the rest of the color scheme I chose a combination of drab military greens and beaten silvers, something grounded in reality and not so overbearing to take your attention away from the model’s face/helmet. 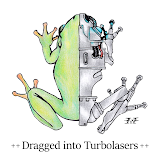 To speed up the painting process, I applied all of the base colors (green and silver) with an airbrush. Once dried, I used a brush to apply highlights to the greens and silvers. To add more visual depth and shadows to the model, I used a series of oil paints which I blended with an odorless thinner. To add a little contrast and interest to the model, I painted a few elements red, mainly the grenades she has at her belt and an arm band. The visor and lights on the model glow! From start to finish, including the build and painting, this Mare Solum mercenary took a little less than 2 weeks, a record considering my slow and exacting pace! I am really happy that I was able to take part in the Mare Solum project, even in such a minor way. It was a great opportunity to explore a cool setting and try some new painting techniques. Now I am just excited to watch Dark_Tech_’s Instagram account for updates on the game! That sounds like an awesome idea. Perfect for the Legion of the Damned! I will try and use the glowing paint every opportunity I get! I need Lit! No idea why but I need it. Great job, she looks great. You do need to get some! It was fun to experiment around with. I want to soon see just how much pigment I can get into the paint mix. The more the better! So good! Also that is amazing turnaround time for how amazing of a model you have made. It speaks very highly of how versatile those guard are! The turnaround time for the model was really fast! The model was a good learning experience and helped me start developing faster painting techniques. She looks great! I particularly love the glowing paint. Excellent female representation, as usual. 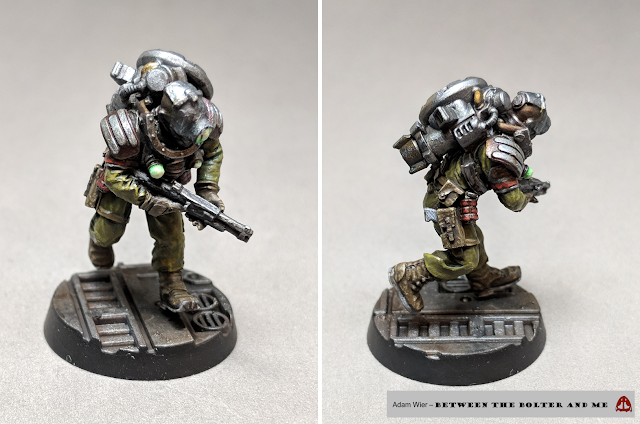 The more realistic looking female models in Warhammer 40k the better! 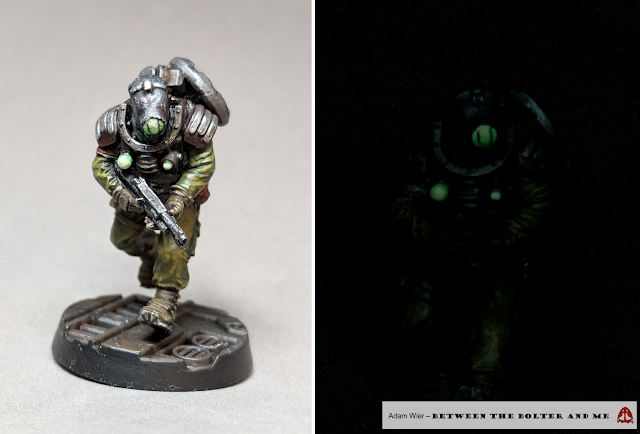 Excellent--nice find on the glowing pigment--one always picks up something new on your blog! I am excited to try out the pigment on other models in the future. I am glad you found the post informative!